By now, exoplanet enthusiasts will be familiar with hot Jupiters, super-Earths, mini Neptunes, and even exo-Venuses, to name just a few. As the search continues, astronomers are finding colder and smaller planets, making possible the discovery of more solar system analogs. In today’s paper, Lora et al. consider exoplanets similar to one of the most tantalizingly Earth-like yet alien bodies in the solar system: Titan. Figure 1. False-color RADAR image of Titan’s north pole from the Cassini spacecraft. Click here for a larger version. Image from the Gazetteer of Planetary Nomenclature. Aptly named, Titan is the second largest moon in the solar system, outdone only by Jupiter’s moon Ganymede. Larger (though less massive) than Mercury, if Titan were to orbit the Sun rather than Saturn, it would be a planet in its own right. Titan’s main claim to fame is being the only known solar system object other than the Earth to have stable liquid on its surface—in lakes and seas, as Figure 1 shows—beneath a thick, hazy atmosphere. 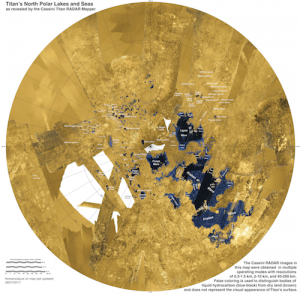 While Earth is amenable to hosting water in liquid, solid, and gaseous states simultaneously, Titan appears to be similarly welcoming—but to methane. Because of this similarity, it’s fun to imagine Titan as Earth’s chilly alter-ego, a cool and hazy home for life—but not life as we know it. The ample hydrocarbons and nitrogen compounds might assemble into lurking carbon-based creatures crawling beneath the haze and swimming in the hydrocarbon seas… But before we get too deep into science-fiction speculations, let’s get back to the science. In today’s paper, Lora et al. use theoretical models to investigate the atmospheres of Titan-like exoplanets orbiting Sun-like stars as well as K and M dwarfs, which are smaller and redder than the Sun. Thanks to Cassini, we already have an idea of what Titan might look like masquerading as an exoplanet around a Sun-like star, but Titan takes about 30 years to orbit the Sun; that’s a long time to wait to detect and confirm an exoplanet! Around an M dwarf, a planet with the same effective temperature as Titan (~80 K) takes only about 2 years to complete an orbit—much easier and quicker to detect. Titan-like exoplanets don’t need to crowd M dwarfs as closely as Earth-like planets do, so they are less susceptible to the notoriously nasty space weather of cool stars and they are less likely to be tidally locked. Though neither issue immediately disqualifies M dwarf planets from the habitability contest, considering a cooler planet appears to solve both problems at once. For this investigation, the authors pair a general circulation model with a photochemical model. General circulation models are widely used in planetary and Earth science to investigate atmospheric dynamics and the driving forces behind climate. While general circulation models can help us understand the bulk motion of the atmosphere, a photochemical model can tell us what atoms and molecules will be present, and in what proportion. Photochemistry is driven by starlight as photons trickle through the upper atmosphere to the surface, providing energy to nudge chemical reactions along. In the case of Titan, the atmosphere is largely made up of nitrogen and methane, with trace amounts of light hydrocarbons like ethane, acetylene, and hydrogen cyanide. The authors pass the model parameters back and forth between the general circulation model and the photochemical model until, roughly 2000 Earth-years later in model-time, the atmosphere reaches equilibrium. Model-generated maps of equilibrium temperature are shown in Figure 2. The slight differences between stellar types arise due to the presence of atmospheric haze; the haze tends to absorb short wavelengths and transmit long wavelengths, so redder stars have a higher proportion of starlight making it to the surface. The amount of haze in each case appears to be about the same, which could mean that haze is a persistent feature of Titan-like exoplanets, regardless of what type of star they orbit. Figure 2. Temperature maps for a Titan-like exoplanet orbiting (from left to right) a G, K, and M type star. The cooler the star, the cooler the stratosphere (top, red and orange) and the warmer the troposphere (bottom, blue and green). Figure 3 from the paper. What observational features would these atmospheres have? 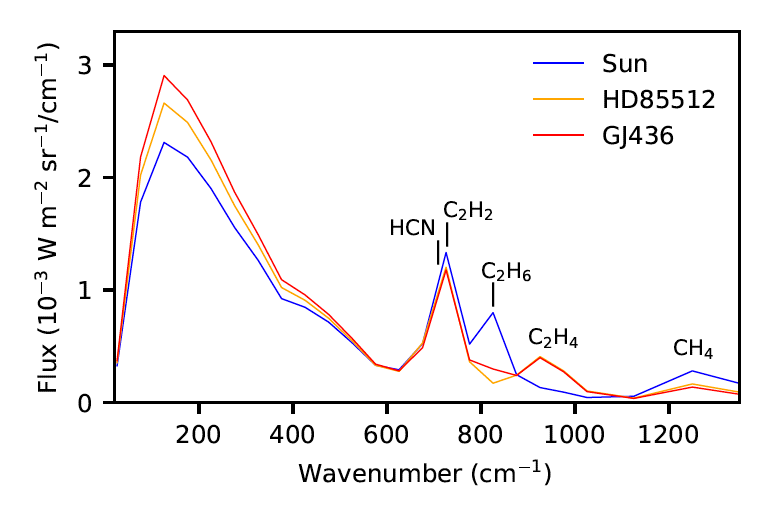 Using the model atmospheres, the authors generate emission spectra for each of the three host star spectral types, which are shown in Figure 3. Figure 3. Globally-averaged emission spectra for a Titan-like planet orbiting the Sun (blue), a K dwarf (orange), and an M dwarf (red). In some cases, the strength of the emission feature is determined by the atmospheric temperature (such as the methane feature on the far right), while in other cases it reflects how much of the compound is present (such as the ethane feature around 800/cm). Figure 9 from the paper. Changing the host star’s spectral type changes the temperature and abundance of each chemical species, which in turn change the strength of the emission features. This work considered only the effect of host star spectral type on Titan-size and Titan-mass planets, but future modeling will consider the effects that changing surface gravity, axial tilt, and rotation rate have on the emission spectra, preparing astronomers to investigate the full diversity of Titan-like exoplanets. With highly sensitive space observatories on the horizon (e.g. WFIRST, LUVOIR, HabEx, OST), models like these will be valuable for atmospheric characterization of cold, hazy planets.